Founded more than 100 years ago to protect student- athletes, the NCAA continues to implement that principle with increased emphasis on both athletics and academic excellence. The NCAA oversees 89 championships in 23 sports. There are more than 400,000 student-athletes competing in three divisions at over 1,000 colleges and universities within the NCAA. NCAA President Dr. Mark Emmert will talk about the Association’s efforts to continue to embed academics and protect and sustain the collegiate/student-athlete model. 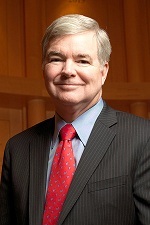 Dr. Mark A. Emmert became the fifth president of the NCAA in October 2010. Prior to assuming his current role, Emmert had been president at his alma mater, University of Washington, since 2004 where he led the university to its standing as second among all public and private institutions in research funding with $1 billion in grants and contracts per year. Before returning to his alma mater, Emmert was chancellor at Louisiana State University from 1999 to 2004. Emmert is a member of the Higher Education Working Group on Global Issues as part of the Council on Foreign Relations. He is the former chair of the Executive Group of the Worldwide Universities Network, and served on the National Security Higher Education Advisory Board. Emmert and his wife, DeLaine, have two adult children, Jennifer and Stephen.